Transparency Market Research has published a new report titled, “Automotive Wiper Market By (Wiper Blade - Standard Blade, Beam Blade, Hybrid Blade; Vehicle Type - Passenger Vehicle, Light Commercial Vehicle, Heavy Commercial Vehicle; Sales Channel – OEM, Aftermarket) - Global Industry Analysis, Size, Share, Growth, Trends, and Forecast 2018 - 2026”. 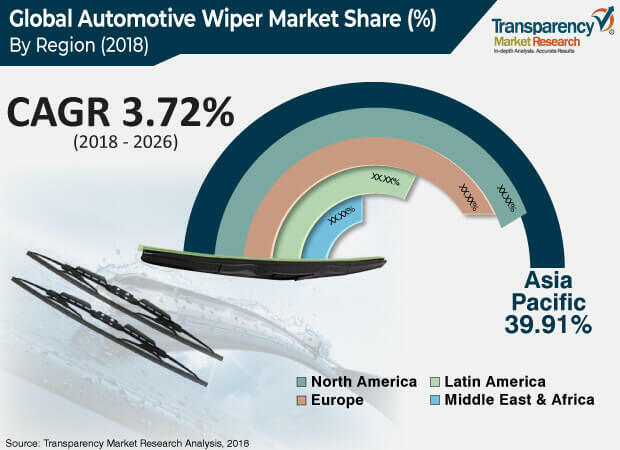 According to the report, the global automotive wiper market is anticipated to surpass US$ 7 Bn by 2026, expanding at a CAGR of more than 3% during the forecast period. The global automotive wiper market is primarily driven by the rise in vehicle production. Expansion of economies of countries in Asia Pacific has boosted the demand for vehicles, which in turn is driving the global automotive wiper market. The global market is anticipated to expand at a steady growth rate of 3% during the forecast period owing to no feasible replacement solution and mandatory requirement of wipers. Shift in consumer demand from sedans to hatchbacks, SUVs, and crossovers is boosting the utilization of rear wipers, which in turn is driving the automotive wiper market. The wiper being a component that experiences wear and tear requires periodic replacement, which translates to a significant aftermarket opportunity. In terms of wiper blade, the beam blade segment held a major share of the global automotive wiper market, owing to their high preference, particularly in North America and Europe. Beam blade wipers provide even contact with the windscreen and have gained high preference among consumers. New vehicles are increasingly being fitted with beam blades and have high OE demand. Hybrid blade wipers are widely integrated in vehicles manufactured in Asia. Hybrid wiper blades are aerodynamic and offer more effective and quiet cleansing. Consequently, the segment is expected to expand at a higher growth rate during the forecast period. In terms of vehicle type, the passenger vehicle segment is expected to dominate the global automotive wiper market. North America and Latin America have a large number of light commercial vehicles and hence, the light commercial vehicle segment holds a prominent share of the market in these regions. Based on region, the global automotive wiper market has been segmented into North America, Latin America, Europe, Asia Pacific, and Middle East & Africa. Asia Pacific accounted for more than half the global demand for wipers in 2017. Share held by Asia Pacific in the global automotive wiper market is expected to further increase owing to the rise in number of on-road vehicles in the region, particularly in China, India, and ASEAN. Thus, Asia Pacific is expected to dominate the global automotive wiper market, followed by North America and Europe. However, the market share held by North America & Europe is expected to decline due to global rebalancing of automotive production hub from Western countries to countries in Asia. Key players operating in the global automotive wiper market include Valeo, TRICO, Robert Bosch GmbH, Mitsuba Corp., AM Equipment, B.Hepworth and Company Limited, DENSO Corporation, DOGA S.A., Federal Mogul Motorparts LLC, HELLA GmbH & Co. KGaA, Magneti Marelli S.p.A., Nippon Wiper Blade Co., Ltd., Pilot Automotive, Robert Bosch GmbH, and TEX Automotive Ltd.